The envelope is 4¼ inches wide and is stamped with the date of January 23, 1949. The number 34 might refer to the 34th Sunday in the church or membership year. If you count backwards 34 weeks, the first Sunday would have been June 6, 1948. Did that church's year run from June to May? 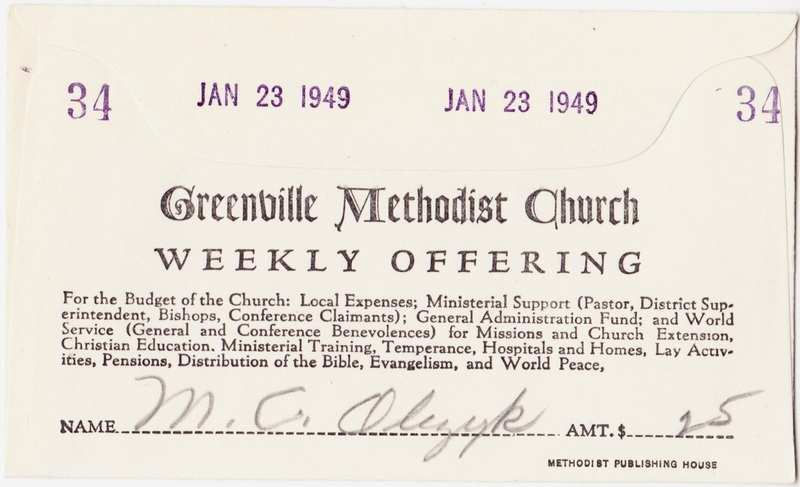 "For the Budget of the Church: Local Expenses; Ministerial Supper (Pastor, District Superintendent, Bishops, Conference Claimants); General Administration Fund; and World Service (General and Conference Benevolences) for Missions and Church Extension, Christian Education, Ministerial Training, Temperance, Hospitals and Homes, Lay Activities, Pensions, Distribution of the Bible, Evangelism, and World Peace." The name on the envelope looks like M.C. Olczyk. But if the (empty) envelope was tucked away inside an old encyclopedia, does that mean Offering #34 was never made? "Come now therefore, I pray thee, curse me this people; for they are too mighty for me: peradventure I shall prevail, that we may smite them, and that I may drive them out of the land: for I wot that he whom thou blessest is blessed, and he whom thou cursest is cursed."